Las Vegas is undeniably synonymous with the Strip: that mecca of excess where the blinding lights of mega-casinos illuminate the way for travelers in search of the perfect night out. But beneath the glitz and the gambling, there is a vibrant city to explore — all you have to do is go for a stroll. 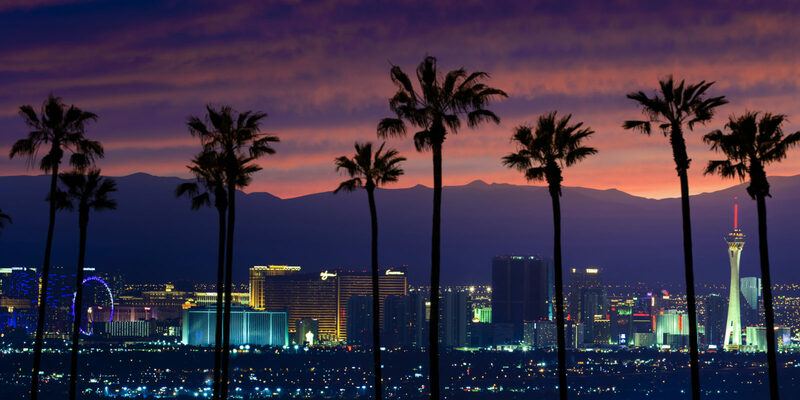 To most visitors, Las Vegas is all about escaping real life to have fun and lose your inhibitions in the adult playground of the Strip — the collection of mega-casinos that line Las Vegas Boulevard. But this is a major city, home to almost a million people who can’t just gamble and eat at incredibly expensive steakhouses every day. So where do the locals really like to go? I spent one of my favorite travel days ever attempting to answer that question — and attempting to walk off one of those aforementioned steakhouse meals. A friend and I, after a bachelor party weekend spent mostly on the Strip or in a cab, set out on our last day on a mission: spend an entire day off the Strip and on foot. Gambling was legalized in Las Vegas in 1931; by the 50s and 60s, downtown Vegas had become a party destination with casinos and cabarets dotting Fremont Street. 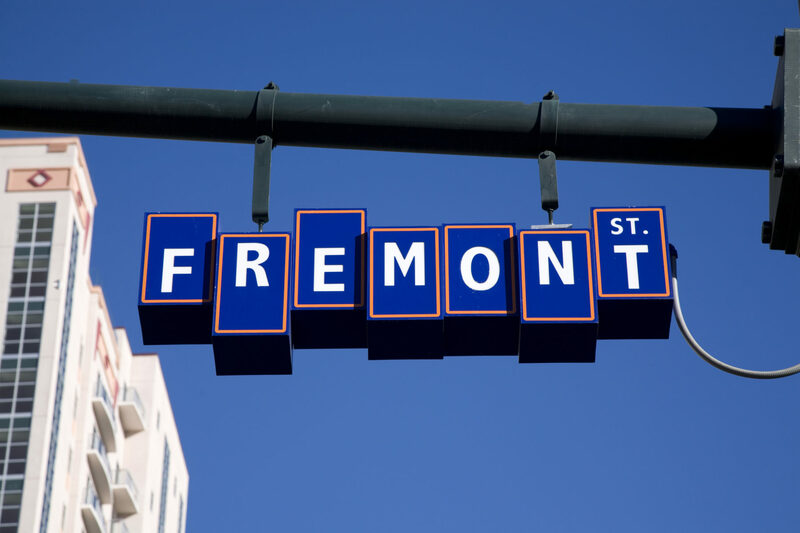 Today, the Fremont Street area seems almost quaint compared to the gargantuan casinos on the Strip, functioning as a kitschier and much less expensive place to gamble. Our first stop was Park on Fremont, an indoor-outdoor hipster enclave serving up southern-inspired comfort food alongside more than a hundred different kinds of beers. We each opted for a Bloody Mary and an egg sandwich to start the day, and the low price alone satisfied after a weekend at the blackjack tables. Once fortified, we walked north on Las Vegas Boulevard to the Neon Museum, where the city’s custom-made neon signs go to die. In a town where every casino competes for attention, it was fascinating to see the discarded signage that’s been put out to pasture. 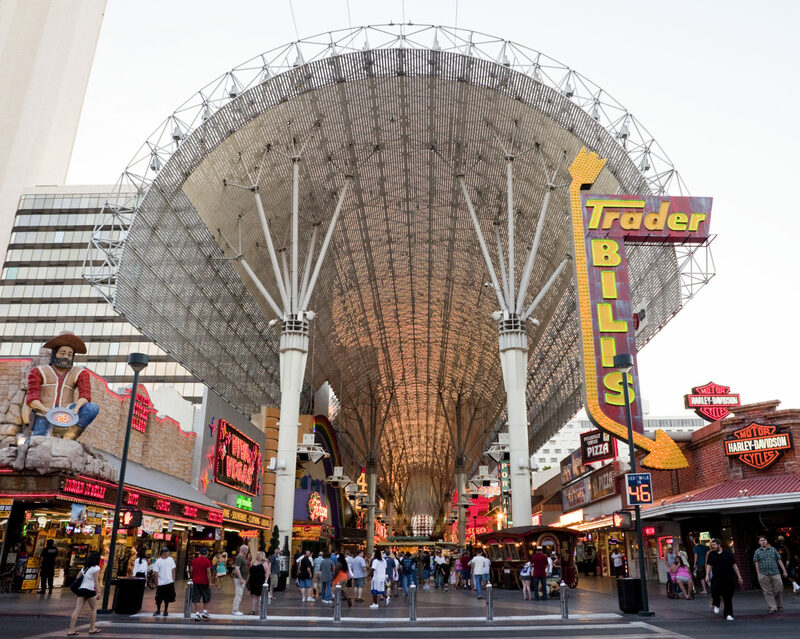 After perusing the pizazz of the past, we sauntered back to Fremont Street to scratch the gambling itch. You can get a table here for a decent price, which will let you play for a bit (and enjoy free drinks) without worrying too much about losing your shirt if you hit a bad streak. Eventually, we were hungry again, so we asked our blackjack dealer where to go. He pointed us toward Pizza Rock, where Tony Gemignani serves some of the best pies in the western hemisphere. He is, after all, a 12-time pizza world champion (yes, that’s a real thing). We filled up on the Gold Medal pie, which features figs, prosciutto and several types of incredibly delicious cheese. We continued our walking tour south past the Graceland Wedding Chapel and into the Arts District, an edgy neighborhood with a few pretty cool bars. We kicked things off at Classic Jewel, a slightly chintzy cocktail lounge with a great happy hour and an even better martini. And lo and behold — it was full of locals: real people who live in Las Vegas year round. We chatted with a couple, both of whom are high school teachers, and heard them describe a life full of weekend barbecues, game nights with friends and an altogether wholesome existence led in the middle of Sin City. Then it was off to Velveteen Rabbit, a craft cocktail bar with a speakeasy vibe that feels like it could easily be in Brooklyn, New York, or San Francisco’s Mission District. But, of course, it has its share of Vegas flair. We walked through the bar to an open-air back patio, where a DJ was spinning vintage funk and a bunch of twenty-something kids were in the middle of a dance-off, even though it wasn’t even fully dark out yet. We decided to try one more beverage, so we hoofed it over to Frankie’s Tiki Room for some Mai Tais. If you like a ton of rum in a room that looks like Fantasy Island, this will be your jam. Sure, it’s kitschy. But the tiki drinks are on point and, from what we could tell, this place is a bit of a destination for those seeking the flavors of the islands. Guess what? We got hungry again. We wanted to find flavor and spice and truly authentic cuisine while still continuing our tour on foot. A nice couple from Chicago told us the best thing after tiki drinks is spicy food, and they pointed us toward what is widely considered one of the best Thai restaurants in the states — Lotus of Siam. We savored every bite of our crispy duck Panang and seasonal soft-shell-crab drunken noodles. The flavors were intense, the spices legit and we washed it all down with some amazing Rieslings, which paired perfectly with the cuisine. Before we knew it, it was time to board the last flight out of Vegas and head back to our real lives. We were so close to just spending that final day by the pool, but instead we’d turned it into one of our most memorable travel adventures. Our decision led to one of those rare, perfect experiences that let you peel back the layers of a city to discover secrets you never knew it had. And to think: all we had to do was go for a walk. Max D. is a writer/video producer and avid traveler living in Los Angeles.